Lateral transfers are one of the most frequent manoeuvres in healthcare, so it is important to use the right equipment that makes the process both safe for the carers and comfortable for the patient. 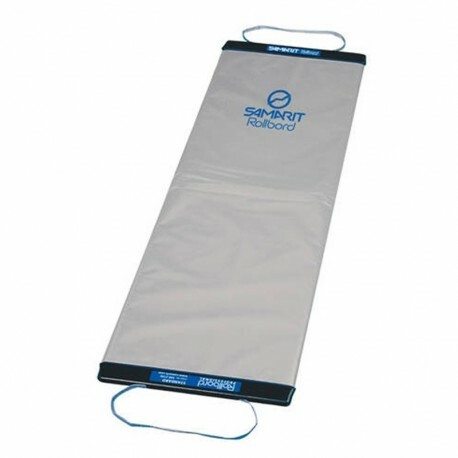 The Samarit Professional Ambulance Rollboard is a very durable and reliable foldable transfer board that has been designed specifically for use on the road. This exceptionally hard-wearing and practical Ambulance Rollboard operates like a tank track and allows staff members to gently push the patient across a gap between two surfaces very easily. This makes it very easy to use by carers, as well as safe and comfortable for patients. Watch the video below for a demonstration of a lateral transfer with a canvas. This Professional Rollboard is strong, robust and tear-resistant, as well as anti-bacterial, anti-fungal and flame retardant. Compact and foldable, the transfer board easily fits into most cars and ambulances and is designed for reliable long-term use. The Ambulance Rollboard is designed as a safe and practical solution for lateral patient transfers, which makes it suitable for use in all areas of healthcare where lateral transfers are frequent. It is especially common in emergency services, hospices and nursing or care homes. The Samarit Professional Ambulance Rollboard is usually delivered by 24 hour courier. For orders that are placed before 2pm Monday to Friday, your order should usually be dispatched the same day for next working day delivery.